The 2017 Honda Ridgeline is in stock now at Brilliance Honda in Crystal Lake. The RTL-T trim level is on the upscale side of the lineup, and it only sits below the Black Edition and RTL-E. It receives many high tech features and upscale amenities that should appeal to discerning pickup shoppers in the Chicagoland area. Find out more here at Brilliance Honda. The RTL-T trim level features a 3.5L V6 engine that generates 280 hp and 262 lb-ft of torque. A six-speed automatic transmission and front-wheel drive are both standard, and they help the Ridgeline achieve an EPA estimated 19 mpg city/26 mpg highway/22 mpg combined*. When paired with an available all-wheel drive and a six-speed automatic transmission, the Ridgeline is rated at 18 mpg city/25 mpg highway/21 mpg combined*. When properly equipped, the AWD Ridgeline is rated at up to 1,562 pounds of payload capacity and up to 5,000 pounds of towing capacity. The Ridgeline RTL-T comes standard with features that are included on the lower level RTL trim and below, as well as some key upgrades. These include a Honda Satellite Linked Navigation system, an 8-inch touchscreen infotainment system, as well as Apple CarPlay and Android Auto smartphone integration systems. Other highlights include power adjustable front seats, leather trimmed interior, heated seating, 18-inch alloy wheels, three-zone automatic climate control, remote engine start, smart entry, and more. The Honda Ridgeline RTL-T come standard with important safety and security features including a multi-angle rear camera, traction control, and anti-lock brakes. The RTL-T even includes a tire pressure monitoring system, as well as LED daytime running lights. 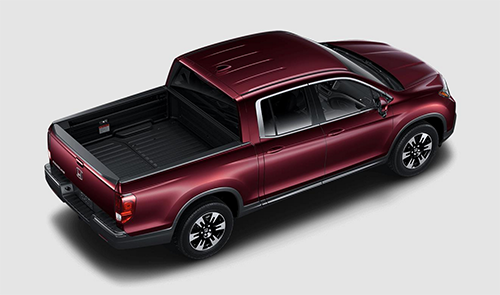 The latest Honda Ridgeline is available in a variety of trims here at Brilliance Honda. Located at 680 W. Terra Cotta Rd. in Crystal Lake, IL, we carry a wide variety of Honda models, and we’re happy to help you find the right one for your needs.